A bird expert once told me that Jeff Wells will one day be viewed as one of the great ornithologists of his generation. Jeff, the former national conservation director of the National Audubon Society, is a visiting fellow at the world-renowned Cornell Lab of Ornithology (where he worked for years) and the science and policy director of the Boreal Songbird Initiative. He is a soft-spoken but forceful advocate for conserving what's left of the habitat that animals—especially birds—require to breed, feed and survive. Jeff is also a Maine native and a friend of The Naturalist's Notebook's. He led a Notebook birding walk in Seal Harbor a couple of years ago, and we are big promoters of a book he and his wife, Allison, also an ornithologist and conservationist, wrote called Maine's Favorite Birds. 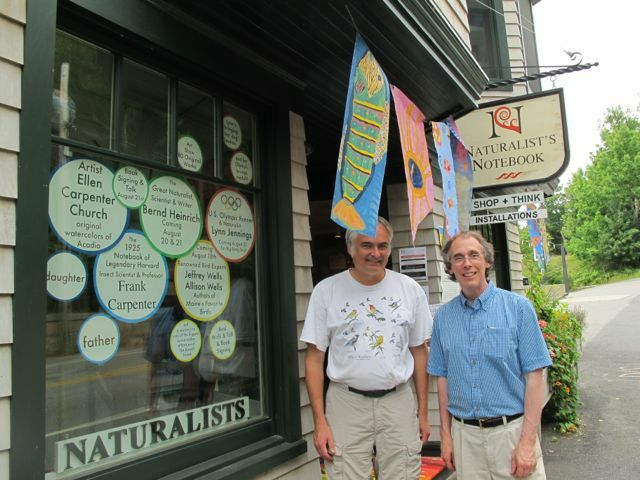 We used the book to create an indoor birding trail in the Notebook two summers ago and have been trying to establish a downtown birding trail in the village of Northeast Harbor, Maine, by encouraging merchants to put illustrations from that book (beautifully done by artist Evan Barbour) into their shop windows for passers-by, especially kids, to identify. In the long term, we would love to help Jeff achieve his dream of getting the book into the hands of every student in every Maine school. Jeff lately has focused his energy on preserving the vast expanse of boreal forest in northern Canada and Alaska. Working with fellow scientists from the Boreal Songbird Initiative, Ducks Unlimited and Ducks Unlimited Canada, he has co-written a new report called "Boreal Birds Need Half: Maintaining North America's Bird Nursery and Why It Matters." It's an extremely important assessment because many bird populations have been declining substantially in recent decades. Since the late 1960s 20 of the most common North American birds have fallen in number by at least half, and the population of evening grosbeaks (to name just one example) have fallen by nearly 80 percent. I asked Jeff to describe the boreal forest and its value to birds. 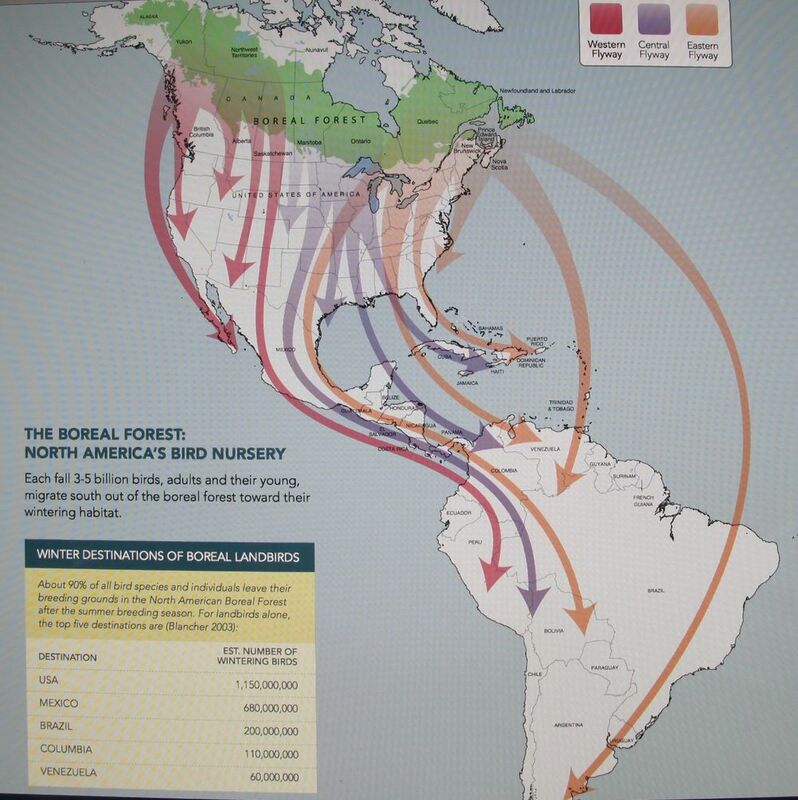 This map shows the routes taken by birds leaving the boreal forest in late summer and fall. According to Jeff’s report, between 3 billion and 5 billion birds migrate south after young have hatched. About a billion of them winter in the U.S.; others fly as far as Tierra del Fuego, at the southern tip of South America. "This abundance of birds occurs here," Jeff continued, "because the boreal forest region is still mostly unfragmented and within the region there is an amazing diversity of healthy and pristine habitats including millions of lakes and ponds, one of the world’s largest wetland complexes, forests of spruce, jack pine, balsam fir, and aspen, bogs, fens, marshes, tundra, barrens. And along with all these birds, the boreal forest region supports North America’s last remaining large populations of wolves, grizzy bears, wolverine, caribou and even the southernmost population of polar bears in the world!" Two of the birds under threat are the Canada warbler and the evening grosbeak. Studies have determined that most of the songbirds and waterfowl that breed in the boreal forest do so in low densities over large expanses. Protecting those birds means preserving vast tracts, not small, concentrated nesting areas. And that is the message of Jeff's report. At least half of the boreal forest "must remain free of large-scale industrial disturbance," the report states, and "industrial activities undertaken in the remaining unprotected areas should be carried out with the highest global sustainability standards, with an emphasis on maintaining healthy and pristine wetlands and waterways." Jeff and the Boreal Songbird Initiative will continue to work to see that those goals are met, in negotiations with the Canadian government, provincial governments, native populations and industry. The birds don't have a voice in the matter, unfortunately, so Jeff—and we—have to speak for them. That's Jeff (left) on a visit to the Notebook. Here is a portion of the birding group on the Notebook deck holding up Jeff's book. 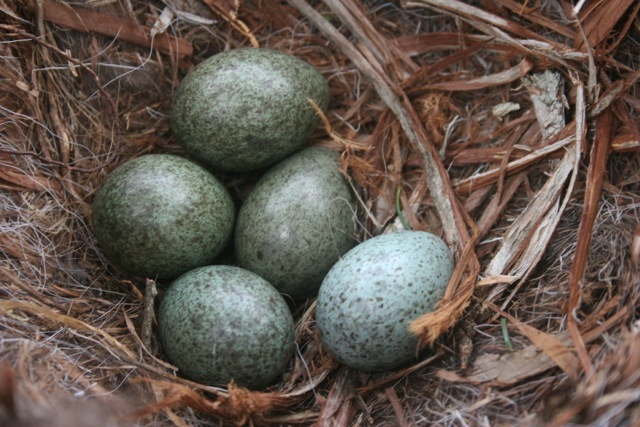 A bonus treat for those of you who don't see The Naturalist's Notebook page on Facebook: A photo of crow's eggs taken recently by the great naturalist and writer Bernd Heinrich near his cabin in western Maine. Yes, Bernd climbed to the top of a tree to get the shot.